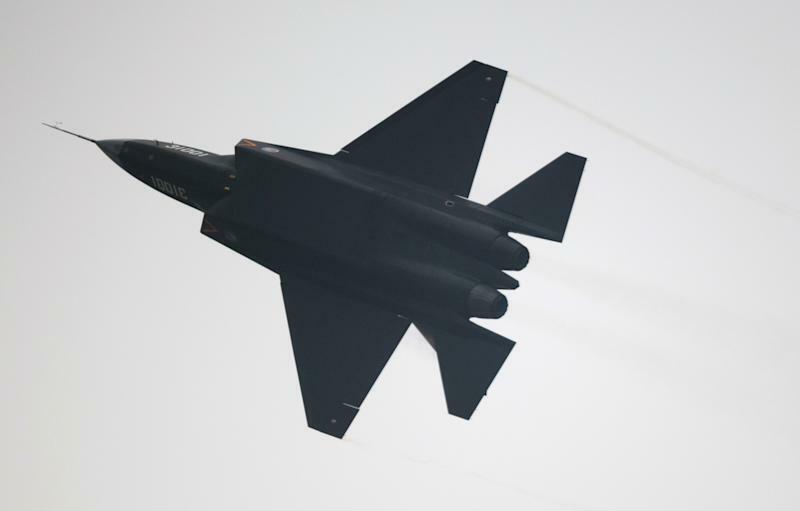 Zhuhai (China) (AFP) - China's new stealth jet fighter rocketed skywards Wednesday as Beijing puts on an unprecedented display of openness -- and military force -- at the country's premier airshow. 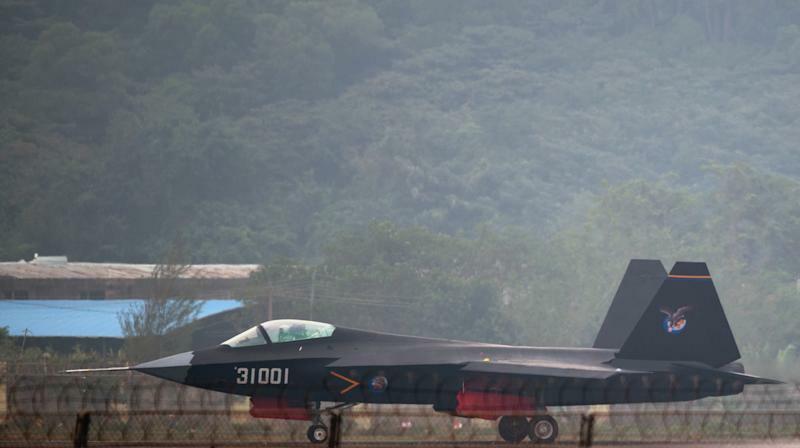 The black J-31 rose in a nearly vertical climb on take-off in Zhuhai before circling back and doing two rolls, in the aircraft's first announced public appearance. The plane's existence has been the subject of rumour and speculation for years, with photographs appearing increasingly frequently on military websites in recent months. Defence analysts say the J-31 is China's answer to the United States' F-35, though the Chinese jet lags behind the American one technologically. The fighter's Chinese name is "Falcon Eagle" and it is manufactured by a unit of Aviation Industry Corp. of China (AVIC), whose defence arm uses the slogan: "We are making the best weapons for guardians of the peace." The plane's debut comes amid tensions between China and its neighbours over territorial disputes, particularly Japan which has feuded with Beijing over a group of islands in the East China Sea. China's air force said the display of military might at the airshow showed the intention to build a strong country. The People's Liberation Army (PLA) air force "will make unremitting efforts to realise dreams of a strong China and powerful armed forces", read a sign alongside an array of eight warplanes at the airshow. "The display... demonstrates the strength and confidence of (the) PLA Air Force to fulfil missions and achieve world peace." China has steadily increased its defence budget for years, with funding projected to rise more than 12 percent to $132 billion in 2014. But the US has accused Beijing of under-reporting its spending by as much as 20 percent in the past. 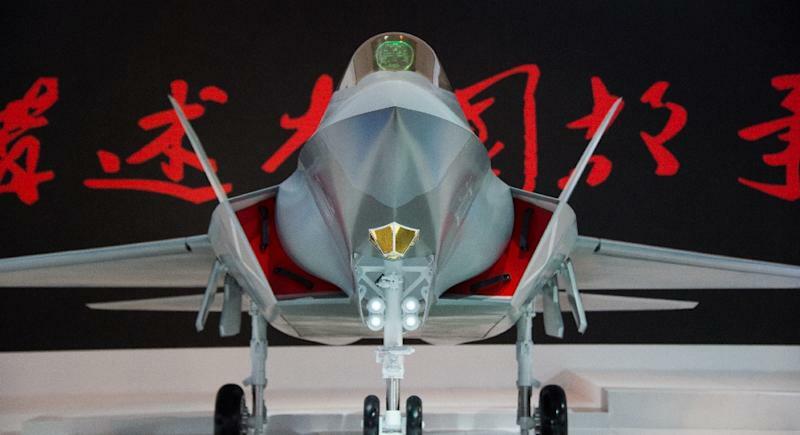 Defence analysts said China appears eager to sell the new fifth generation fighter abroad, also putting on display a model with a designation typically used for overseas destinations: FC-31. "China's defence industry wants to show the potential for export," said Andrew Erickson, associate professor at the China Maritime Studies Institute of the US Naval War College. Ally Pakistan is a likely first market, he added. AVIC has already developed another fighter plane, the FC-1, in cooperation with Pakistan which was also on display at the show. A large military transport plane, the Y-20, also made its debut at the show, flying lumbering turns over the crowd at its public outing on Wednesday. "Of course, it is an advance in technology," said the announcer as spectators craned their necks to see it against a smoggy sky. The China National Precision Machinery Import-Export Corp., the firm at the heart of controversy over the supply of a long-range anti-missile system to Turkey in the face of US opposition, also had a presence at the show, but its booth was devoid of product displays. The firm, which is under US sanctions for selling arms and missile technology to Iran and Syria, declined to provide promotional materials or answer questions when approached by a journalist. Although billed as an airshow, new sponsor China North Industries Corp (NORINCO) showed off a battle tank, the VT4, which proved a popular backdrop for visitor photos. Other countries in the Asian region have beefed up military spending in response to China's growing power. "It's a bit of a dance that happens all over the world," said Briand Greer, president of aerospace for Asia-Pacific at US conglomerate Honeywell. "Economically everyone is tied to what happens in China," he said. "But at the same time, you’ve got a huge power rising right in your backyard so you don’t want to feel helpless."